Hawksbridge Cottage01535 647935work Self-catering19th century country cottage with panoramic views from every window. Original features and beamed ceilings, comfortable and warm, central heating, living flame gas fire in stone fireplace. Large lounge, dining kitchen, 2 bedrooms, bathroom, patio, and off road parking. Weekly bookings arrive Saturday after 3pm and depart following Saturday before 10.00am. Short breaks also available. Food stores, local pubs, restaurants and take-aways in nearby villages. Nearest mainline railway station is Keighley. Details of local bus services and taxis on request. Ideal walking & cycling country. Within easy reach of Haworth, Bronte Parsonage, Haworth Moor, Bronte Waterfalls and the Keighley and Worth Valley Railway. 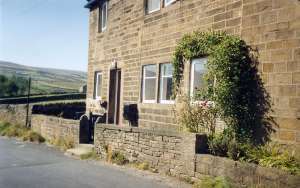 Meals served at local pubs in Haworth / Oxenhope. Within easy reach of nearby towns, Colne, Keighley, Skipton, Hebden Bridge, Bradford. Children welcome from age 3. A629 right at mini roundabout A6033 to Haworth, past Railway Station and over railway bridge. Follow signs for Oxenhope, along Sun Street. At junction signposted Oxenhope left, continue ahead. At next crossroads, turn left for 100 metres, then first right into Hawksbridge Lane.